Hi everyone! Thanks for dropping by. Would you like to know how to cut Drunkard's Path patches with absolute minimal waste? Does that sound interesting? Then keep on reading. 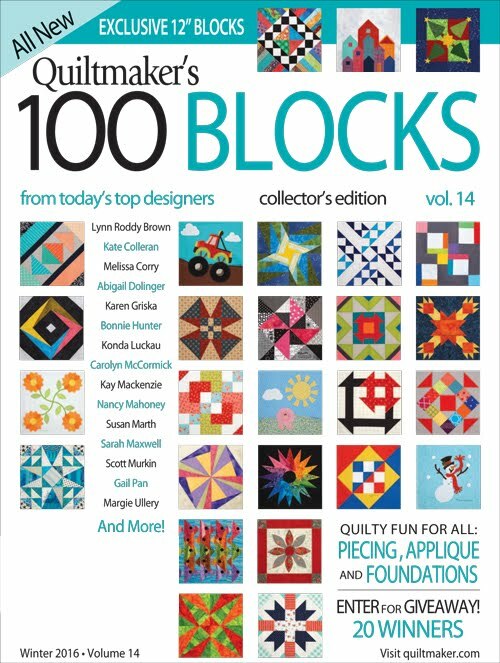 About one and a half to two years ago I started making more and curved blocks and piecing them. 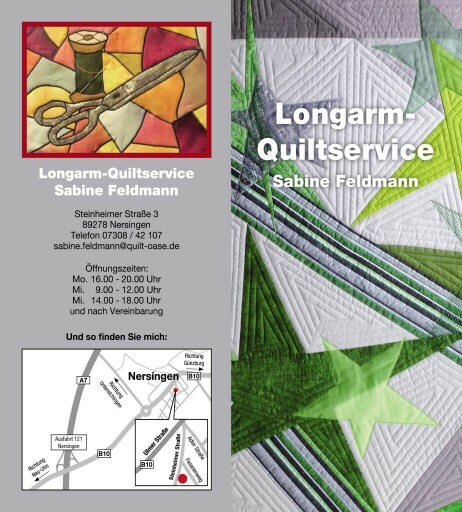 Every time, I would do this, I would cut and make templates from Electric Quilt 8. As you know, after using cardboard templates a few time, they get a little smaller with every use. I wondered if there was an alternative such as a multi-purpose cutting tool for cutting curves. So I started researching. I not only found one, but several different brands that were helpful. 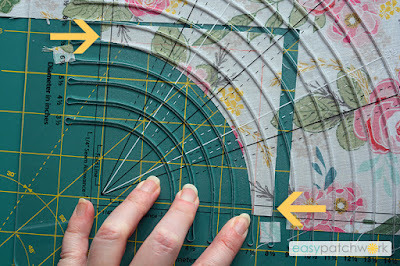 Quick Curve Ruler (Sew Kind of Wonderful) makes two sizes (one size per ruler). I have not confirmed if it will work for this tutorial. It incorporates STEP ONE in their description and use but does not include STEP TWO. To my knowledge, the curve is slightly distorted. Since I wanted the best solution for my money that could make as many different circle sizes as possible, I decided to purchase the Circle Savvy Ruler. It can make whole circles (diameter) in the sizes ranging from 3" to 15". 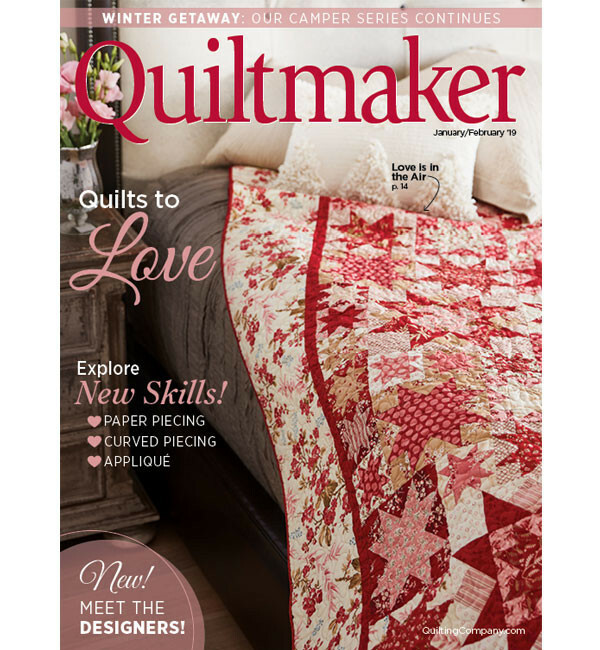 It was very helpful when I designed a quilt that used ringed circles. You might remember the Retro Circles quilt? Some of you may fear and avoid curves like the plague, but there really is no reason to fear them. As with everything, practice and a steady slow pace help a lot. 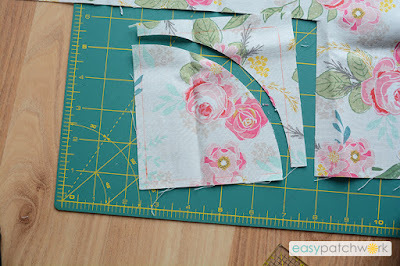 There are also a few tricks and tips about sewing curves on how to decrease puckering and reduce pinning. I am not going to talk about those today. There are already lots of tutorials and information out there about that. We are here to learn about how to cut out Drunkard Patch patches with little or nor waste. Let's begin with a little anatomy of the block. 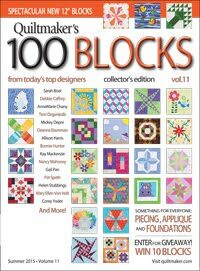 The concave part of the block should remind you of a "cave," because that is where the word originates from. The sun part of the block is convex. 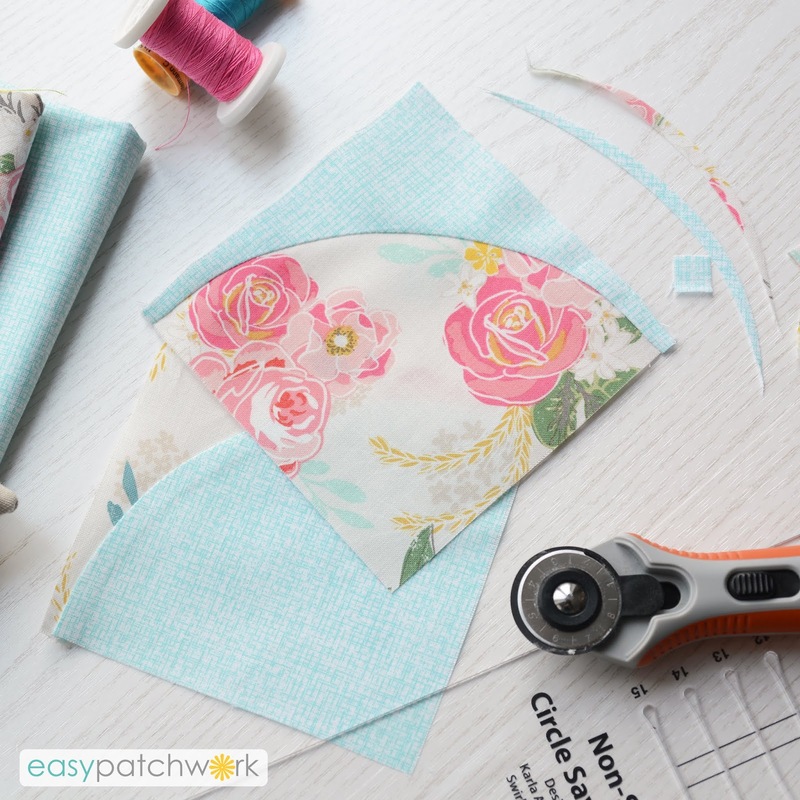 Unlike sewing together squares and rectangles, circles and curved edges will not be the same length when sewing them together. The length of the CONCAVE edge (circumference) will always be slightly shorter to accommodate the seam allowance. 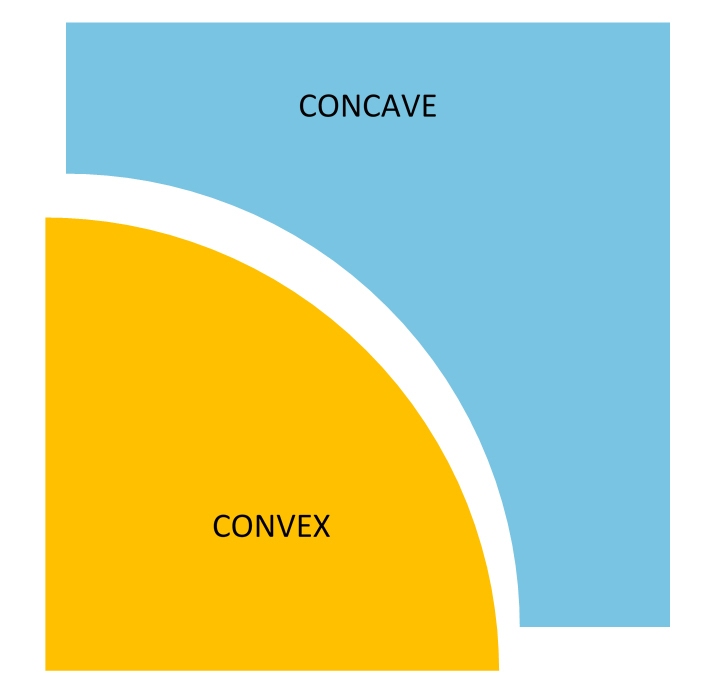 This is usually where some have problems, because the edge will have to be pulled to fit to the longer convex edge. You may think that cutting one curved edge from one piece of fabric will work but it does not. 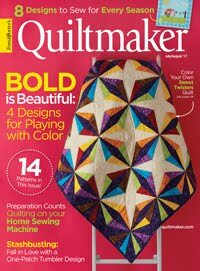 There are two more steps involved to make it work to produce an exact quarter circle. STEP ONE. Make the lengths of the CAVE edge shorter by reducing the size of the block. STEP TWO: Recut the curve on the CAVE edge so it will fit the curve exactly including the seam allowance. 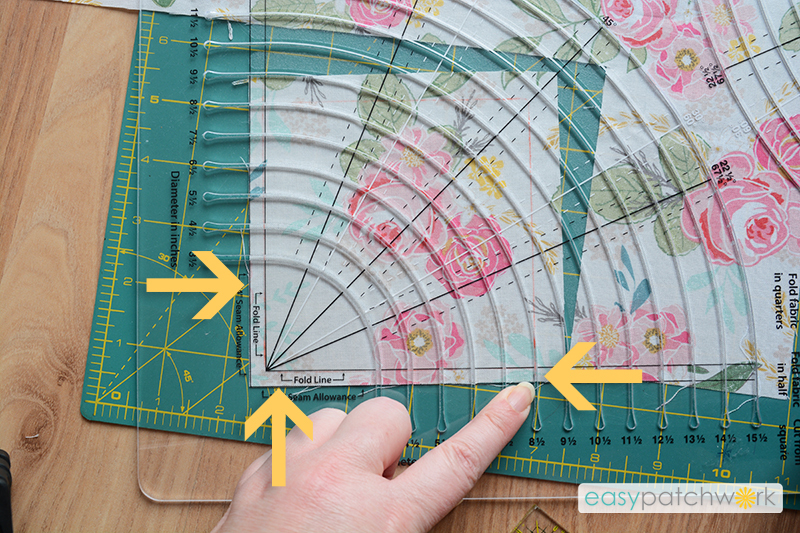 If you have a Quick Curve Ruler from Sew Kind of Wonderful, then you already are familiar with the first step. 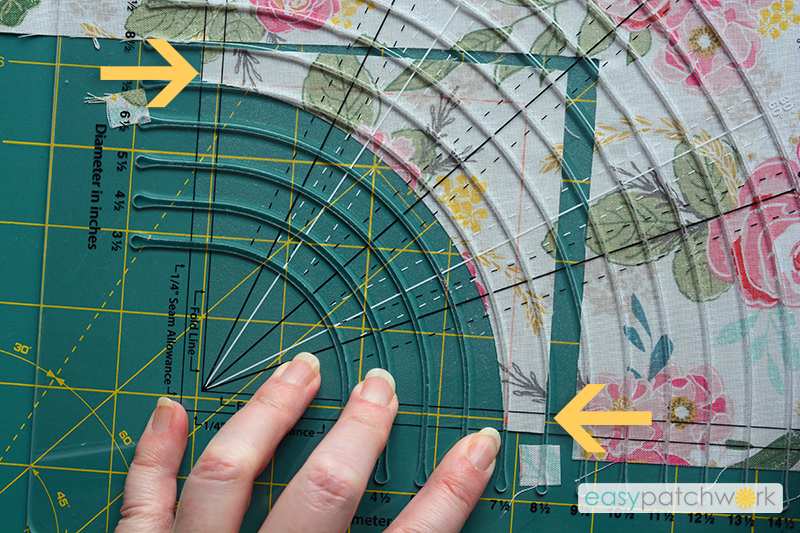 This is done be sewing the CONVEX part of the circle 1/2" into the CONCAVE edge on both sides. Reducing the size of the block and cutting off the edges is actually done after the patches are sewn together. Step two is not carried out. So, that's a little bit of the background behind the idea. Now on to the practical exercise. This can be used with any size curve and curved ruler from the four mentioned above. 1. 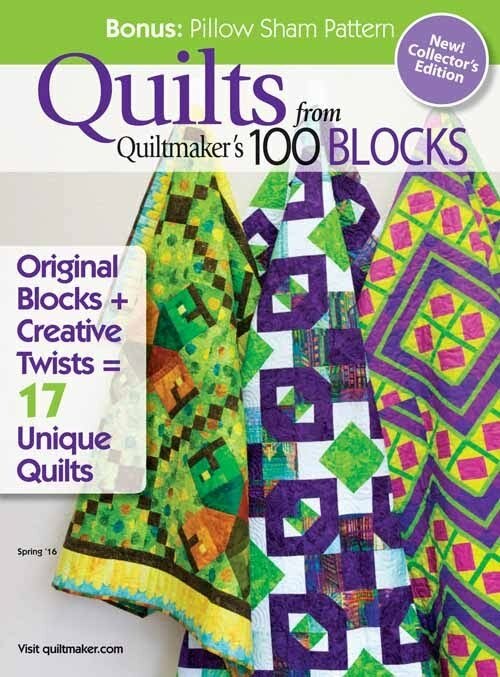 Cut two (5) inch squares. 2. Mark a 1/4" seam allowance on the bottom and left side. This is where we will be matching up the cutting ruler including the seam allowance. [YELLOW LINES] After you become familiar with this idea, you may eliminate in the future. 3. Mark an ending line on the top and side right sides where you will be lining up the curved cut. [RED LINES] Starting flush at the bottom left corner, draw lines to make a 4 1/2" square. Why? 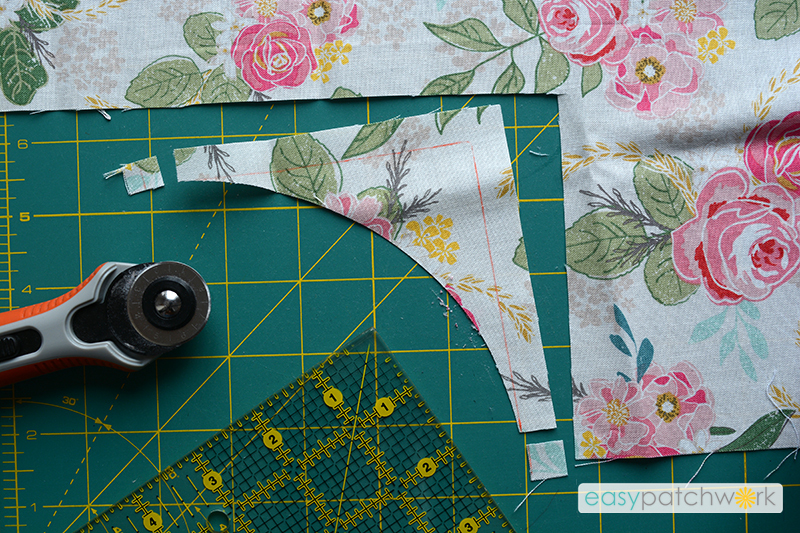 This includes a 1/4" seam allowance on all four sides. I am also right-handed, so this tutorial is showing the right-handed way. For left-handed cutters, you will rotate everything 90° to the left. 4. 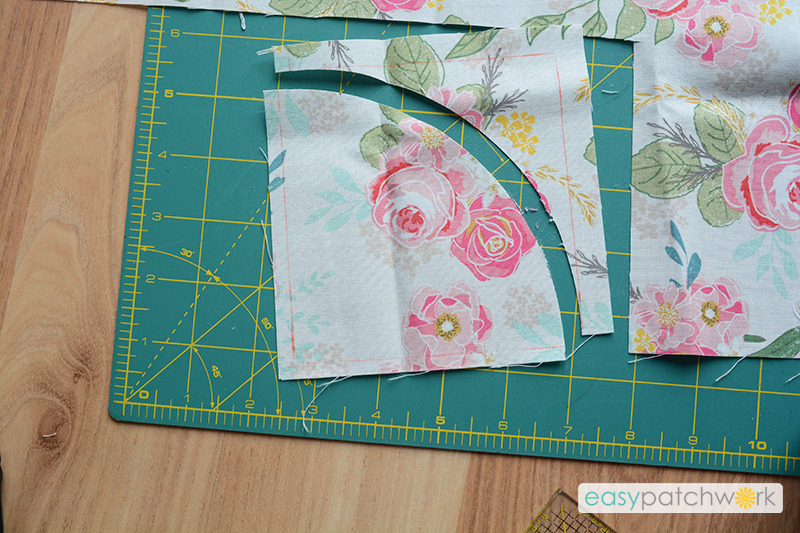 Line up the edges of the cut square on the seam allowance line of the cutting ruler. 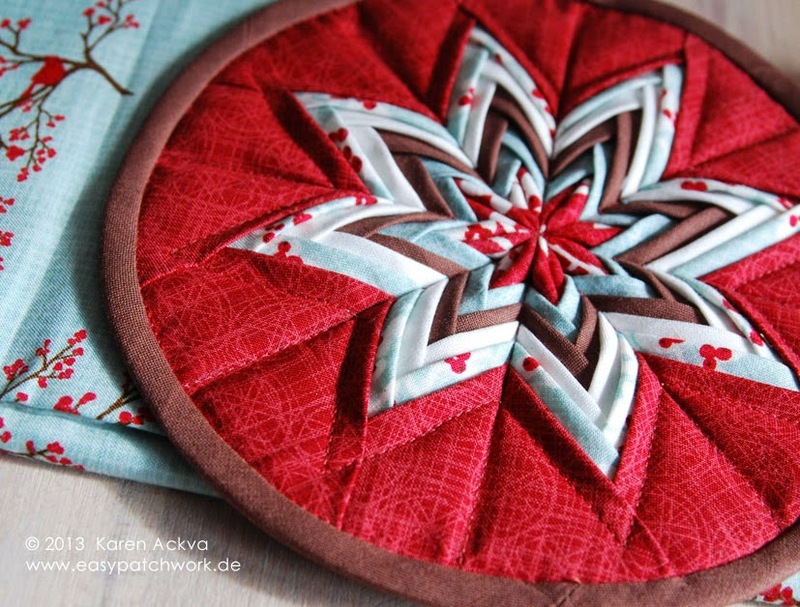 Your outer line (4 1/2" square in red) will match with one of the slots of your circle cutting ruler. This is the 8 1/2" line on the Circle Savvy Ruler. 5. Cut through the slot using a 28mm rotary cutter perpendicular to the the mat if possible. You now have a convex and a concave patch. The fun part begins. We will adjust them for the exact proportion and radius. STEP ONE: Measure and cut off 1/2" on each side of the CAVE patch as shown below to make the curved edge shorter. STEP TWO: Adjust the radius. 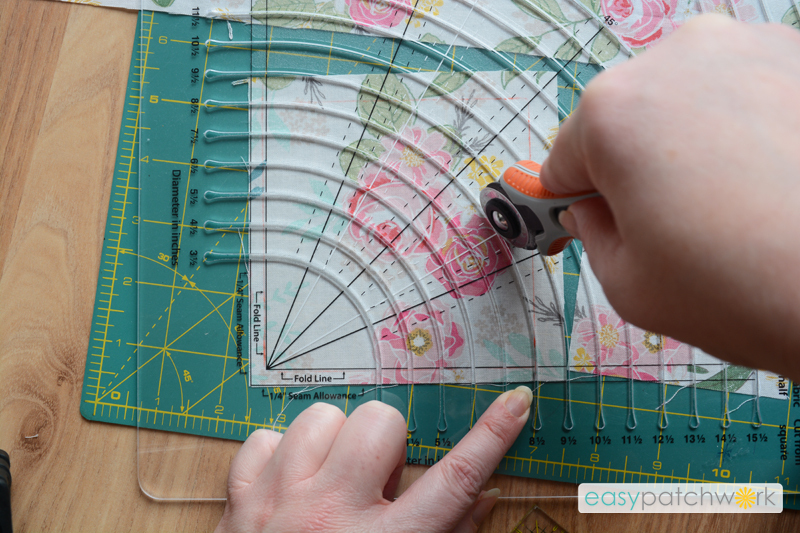 Line up the CAVE patch with the seam allowance lines on the curved cutting ruler. Do you notice the number on the ruler is now 7 1/2"? There is always a one-inch difference of the inner and outer curves. Remember this for future cuts. Why is it one inch? 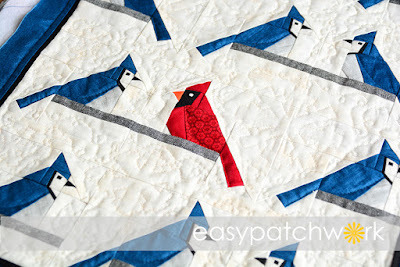 That is four times your seam allowance. Your CONVEX patch is slightly longer (8 1/2" cutting line) whereas the CAVE patch is slightly shorter (7 1/2"). Now cut again using a 28 mm rotary cutter perpendicular to the mat. Here's what you have - minimal waste, perfectly round, concave and convex patches for a Drunkard's Path block. 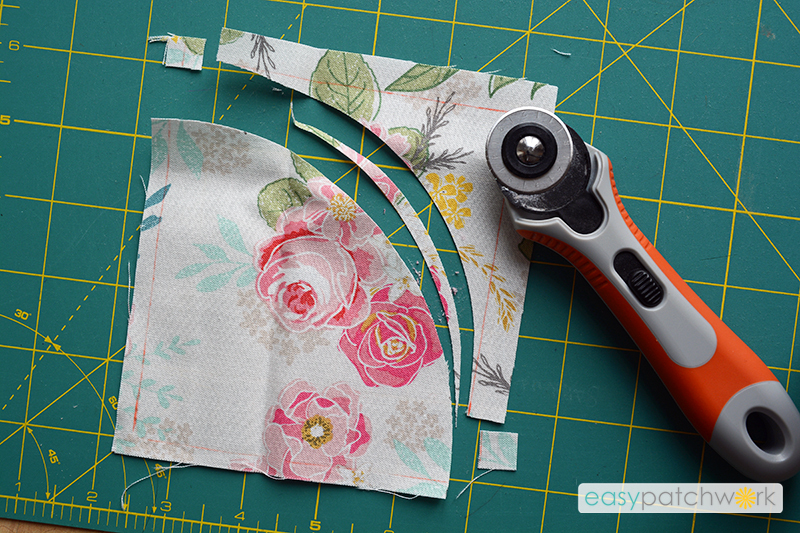 My tip: speed up the process by cutting multiple pieces of fabric! Here is the quick formula to remember. 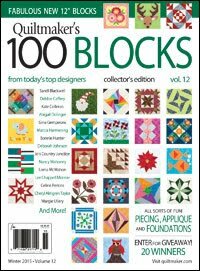 Cut your squares at least ONE inch larger than your finished block size. 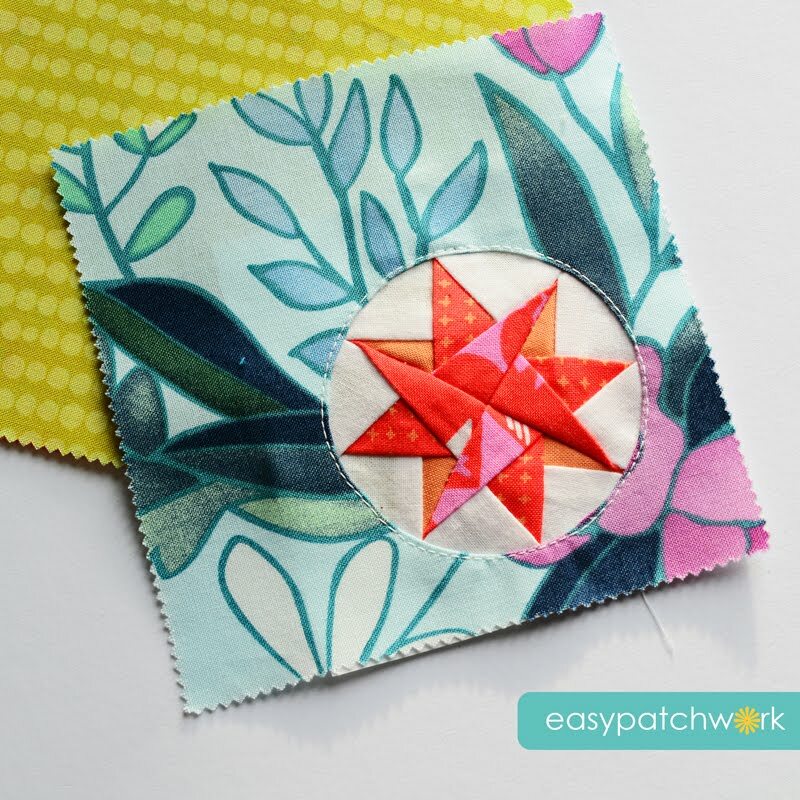 Draw your lines (finished patch size plus seam allowance on all four sides) on a couple of squares to understand where you will cut. 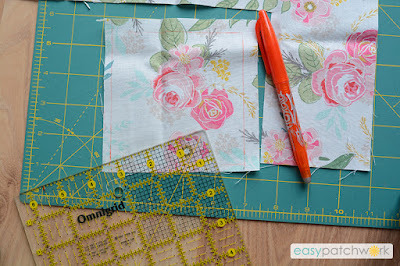 Then mark on your ruler with washi tape or removable marker to eliminate the drawing of lines on your fabric. 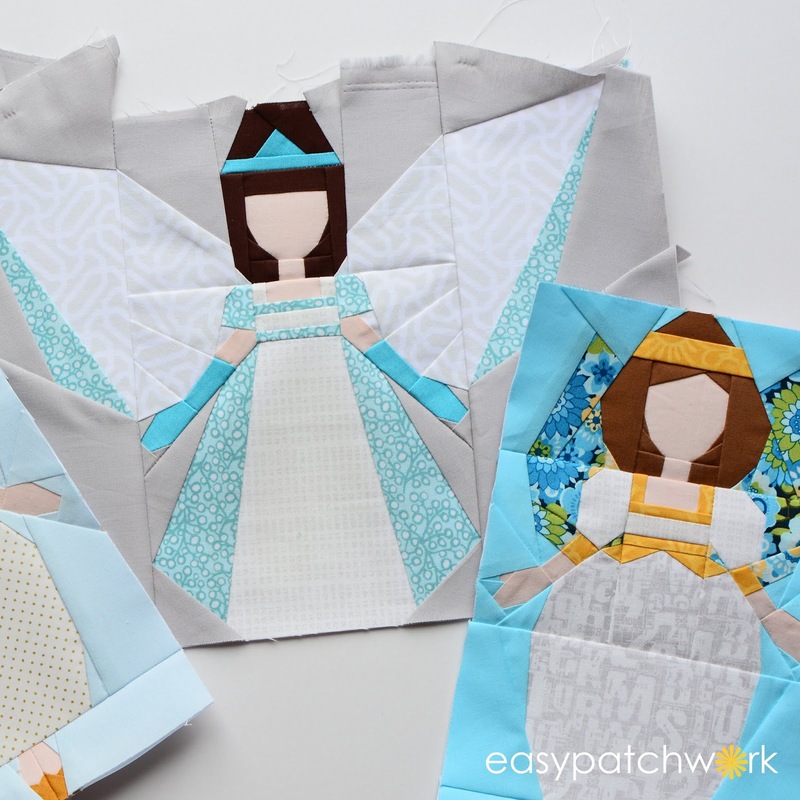 You can always cut larger than needed and trim down later or make different proportional Drunkard's Patch blocks. 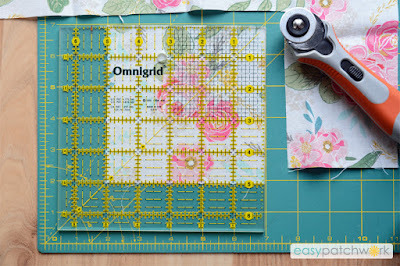 You can refer to this video from Creative Grids that inspired the idea for this tutorial. I would love to hear what you think about the tutorial and see if how it works for you. Please Leave A Little Love (LALL). Thank you! What can I say? It's business as usual, or is it? The longer I have a blog, website and pattern business, the more I get frustrated with the whole deal. Please don't get me wrong. 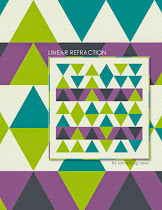 I love designing, writing patterns and teaching. I truly do. It is just the flip side that I don't like. Let me give you a little peak into the other world. 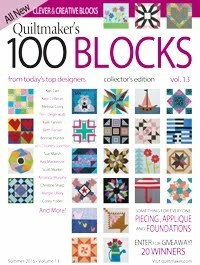 I have been publishing my patterns and free tutorials in the Internet since 2012. 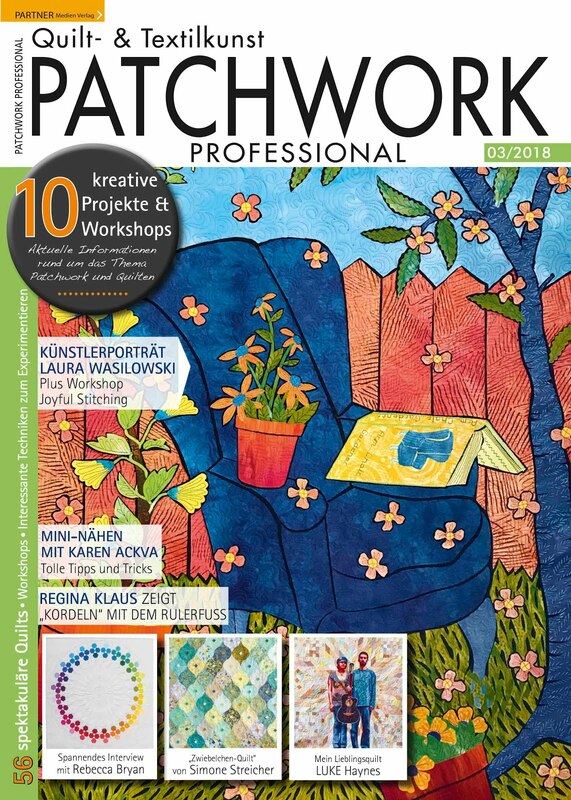 I originally wanted to share my knowledge and help others to learn and feel good about themselves and their patchwork achievements. When someone makes one of my designs or uses my patterns and shares a photo of what they have sewn, it gives me such a great pleasure in knowing that someone liked my design enough to try it out and more importantly, succeeded in doing so. I am also there for you when it comes to trouble-shooting. When a customer is having a problem with a design, I answer questions freely and quickly, because I truly want them to achieve their design. 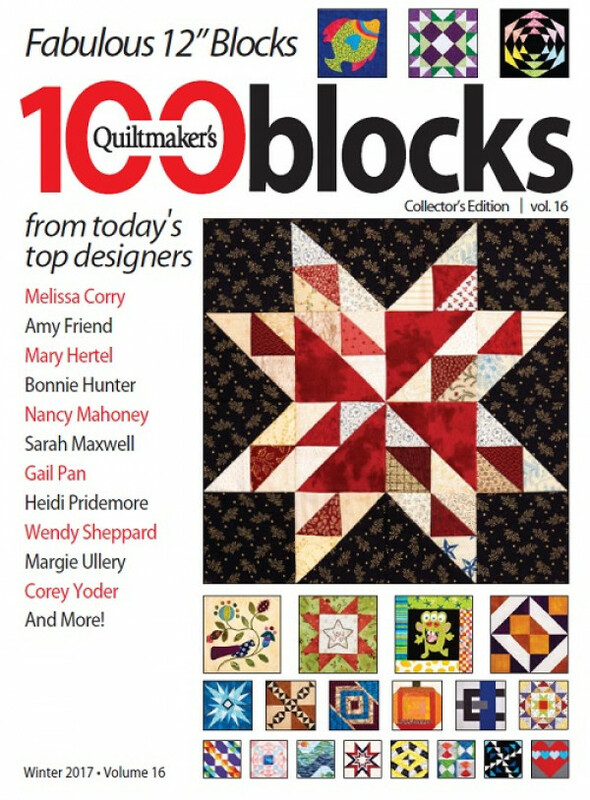 With most of my designs and tutorials, they were provided without any financial compensation. That was okay with me. I only wanted a small thank you or a photo with a kind pingback to my website or blog. With my IKEA Cutting Table Hack post, I received many pingbacks, comments, questions and a few "thank you's." It is the all-time favorite post on the blog! It was even linked up in a book. 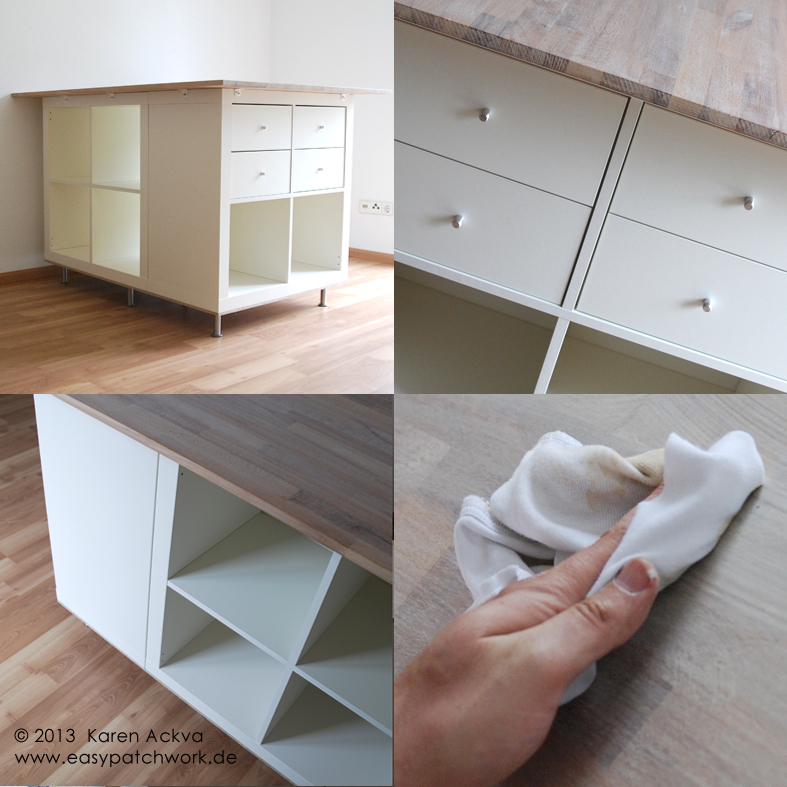 My husband's beautiful work, my idea, my photos! 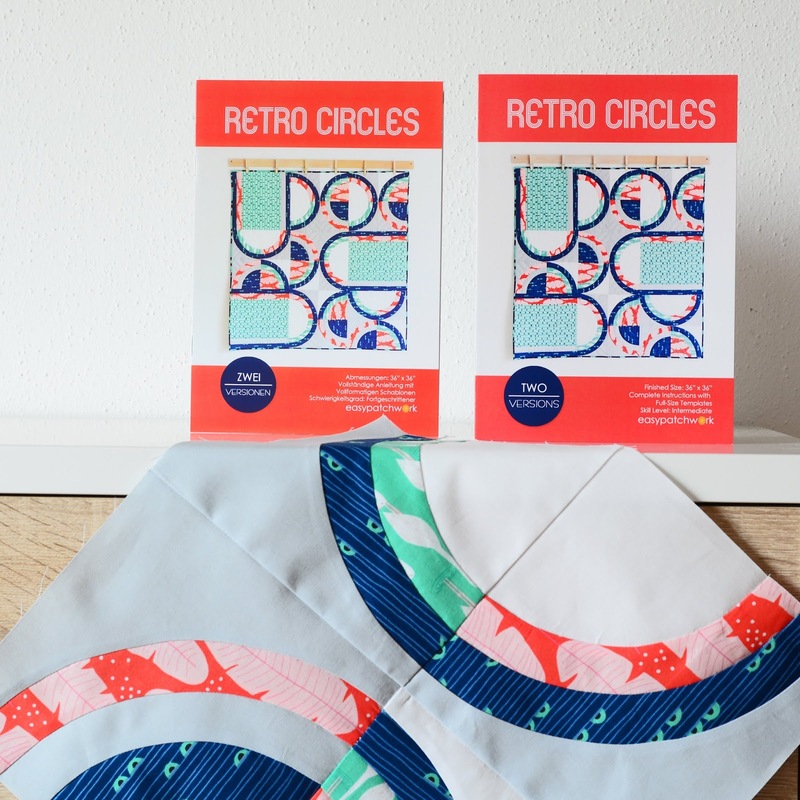 It plays on my heart, when I see a pattern or design that copies one of my ideas without reference to my original design. Why should it, you ask? The fact is - designs are not copyrighted! So I shouldn't feel offended. Only the text on how something is made is copyrighted as well as the actual photo. That is true. (And sometimes, even I fall into the trap of seeing something, getting an idea and running with it to form my own design.) However, you should reference your ideas! 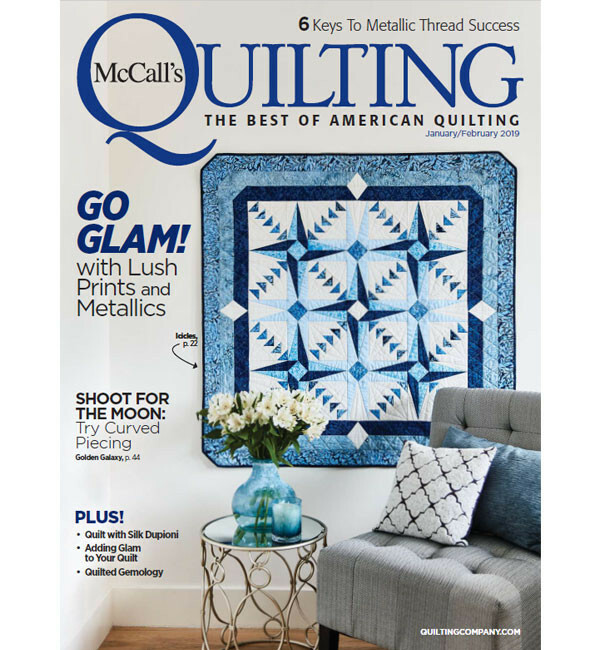 When I submit patterns to magazines, I am required to reference my ideas no matter how trivial. What really bothers me here, is that more and more people, robots, websites are using my free ideas and tutorials to make profit for themselves! I check the statistics of my blog and Etsy shop sometimes to see where traffic is coming from. 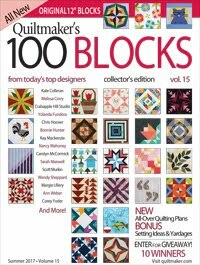 I was alerted once to see a website was referring readers to my shop. That sounded nice, new customers. How exciting! When I looked at the website in more detail, I realized the owner had downloaded and used my photos without my permission and posted them on her website (with a reference to my shop). That's fine and dandy, you say? No, because her website was set up with a great deal of advertising, tracking and was set up to make her a profit (Google Ads, etc.) with readers coming to her site. These are things I do not wish to associate with. I asked her to remove the post with my patterns. She kindly removed them in a prompt manner. I never would have known about this, if I hadn't checked the traffic to my sites. Please remember this too. All photos are copyright protected. You are not allowed to download and post other people's pictures without consent. They do not need the © sign to be copyrighted. The MONA LISA would look a little funny with © Leonardo DiVinci, now wouldn't it? 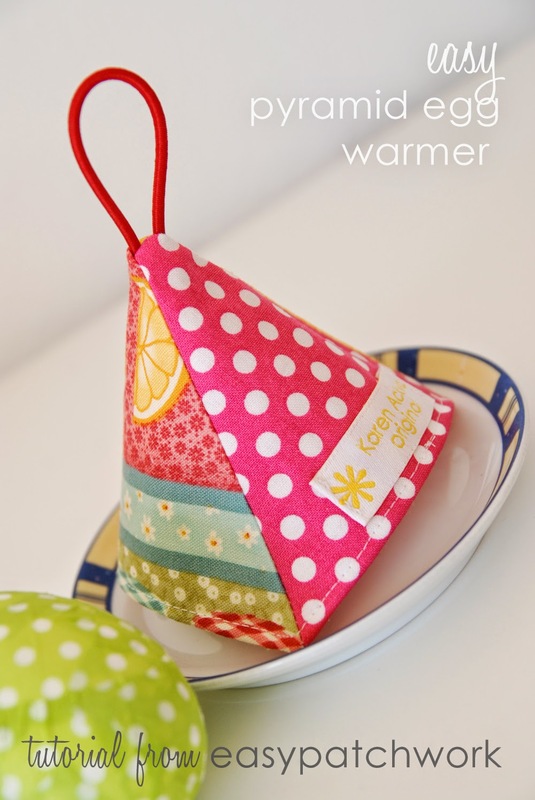 Another point in case is the Mini Pinwheel Pincushion. I love the look of fabric manipulation. 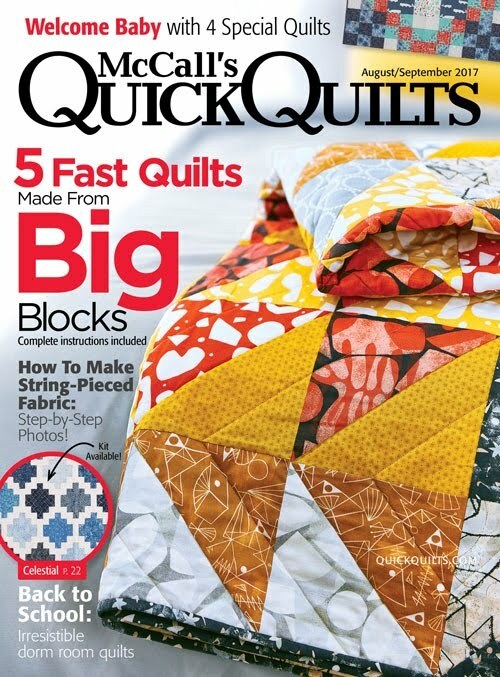 I saw an idea of a fellow patchwork group member, Birgit M., a few years ago making 3-D pinwheels for a baby quilt. I loved the idea and wanted to try it out. 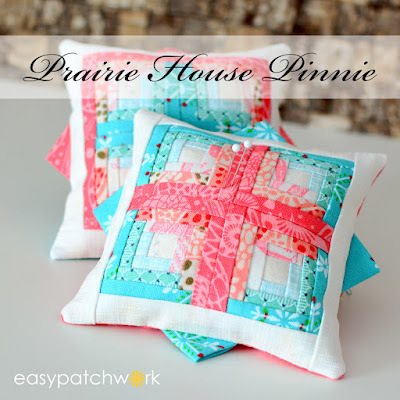 A pincushion is the easiest was for me to try out a new technique with quick results. 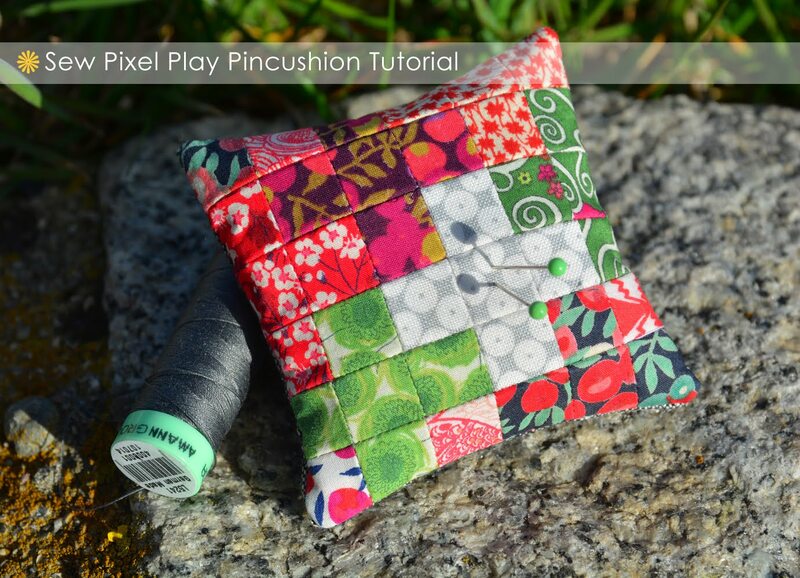 I made a pin cushion and quickly posted on Instagram with some general dimensions and explanation - no tutorial. It was quickly written into a tutorial by another person and posted on their blog with reference to me. I WAS given credit for the idea. 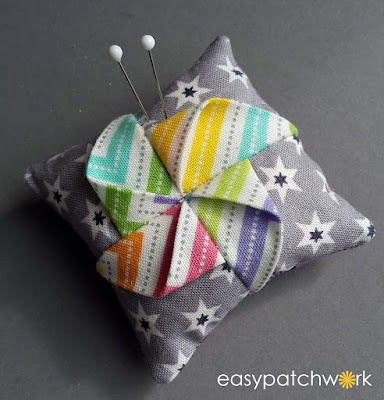 This same idea (mini pinwheel pincushion) was copied by one of the largest fabric and quilting supply retailers in the United States. When I saw their video demonstration on how it was made, my heart dropped. There was no reference to my idea nor to anyone. When I inquired about their idea, their response was, "we saw an idea on Pinterest." What is your take on this? 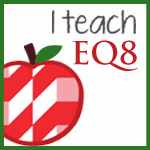 Case 3: At Christmas this year, we didn't give a lot of presents, and I didn't receive anything quilty from my family. 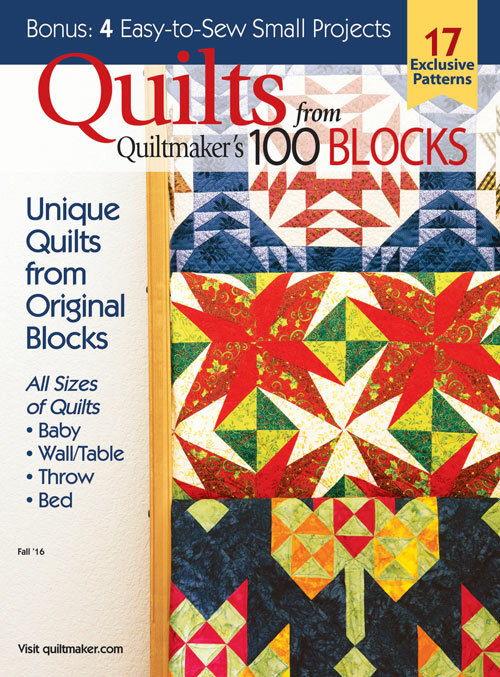 I spoiled myself with a new book about miniature quilts after the new year. I waited for the right moment when all of the chores were done and a free moment was earned to sit down and thumb through the book. 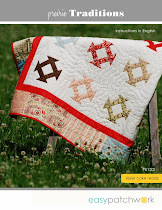 I was dumbfounded when I came to a page showing the "Forgotten Five Mini Quilt" called something else of course. The cutting and assembly directions were written differently, but it was still the same design and effect. The setting was in a 4 x 4 grid rather than my 3 x 3 grid. I believe coincidences can happen, and that people can truly get the same idea when designing. (It has happened to me, too. I try to retract my idea when it does though.) However, this idea was given freely and posted without compensation for the Moda Bake Shop in 2014 written by me. So, did someone take one of my designs for their own profit? I earned recognition for the post but was not financially compensated. 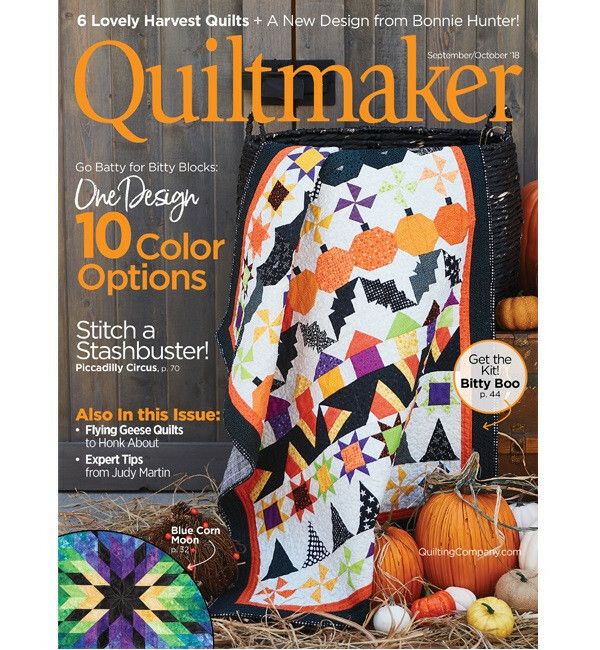 When I design quilts and pincushions, I research for new ideas. I want to create something unique and that hasn't been done before. I write and publish (what I know as) original ideas. It can also be the case that the ideas are already out there, and I have overseen them myself when researching. I apologize if one of my designs has coincidentally copied an other's idea for profit. Please bring it to my attention if it has happened. 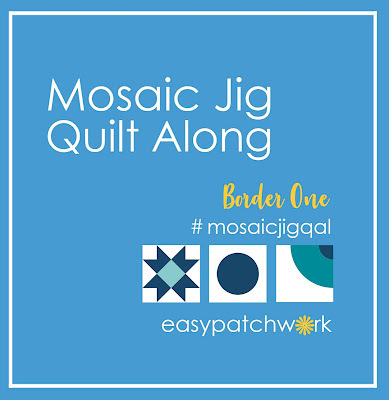 Case 4: With the help of one of my friends, Carmit E from Quilting Rainbows., I was alerted that a robot on Instagram had copied a photo of one of my creations and reposted it on their account. Yes, there was a pingback or reference to my account just like in Case One about the patterns. Don't expect robots to ask for permission to repost. The purpose of robots is to find, harvest and repost good, clear photos without identifiable watermarks or copyrights to gain followers. These are not real people! They have no interest in you. This account will, in turn, be sold for a profit. You might gain a couple of followers by the action, but the bots profit much more. This is happening on a more regular basis and that is why I am trying to watermark all of my photos with a copyright sign. Interesting fact: Press ALT + 0169 at the same time on your keyboard. There's your copyright symbol. I was able to report the repost on Instagram (with a long, lengthy process) and it was removed within a couple of days. I think it was removed quickly, because the photo was copyrighted with a rather pale print which was missed by the robot. I am also more careful about my followers on Instagram. I do check to see who is following me and if it could possibly be a fake account. Fake accounts are usually the robots who are harvesting beautiful, clear, high-resolution photos for their own profit. They also redirect followers from your account to their account. Beware of 10K+ accounts following you without even liking one of your photos. It is purely for the redirection of your followers to their account. With all of my frustration, I still am designing. 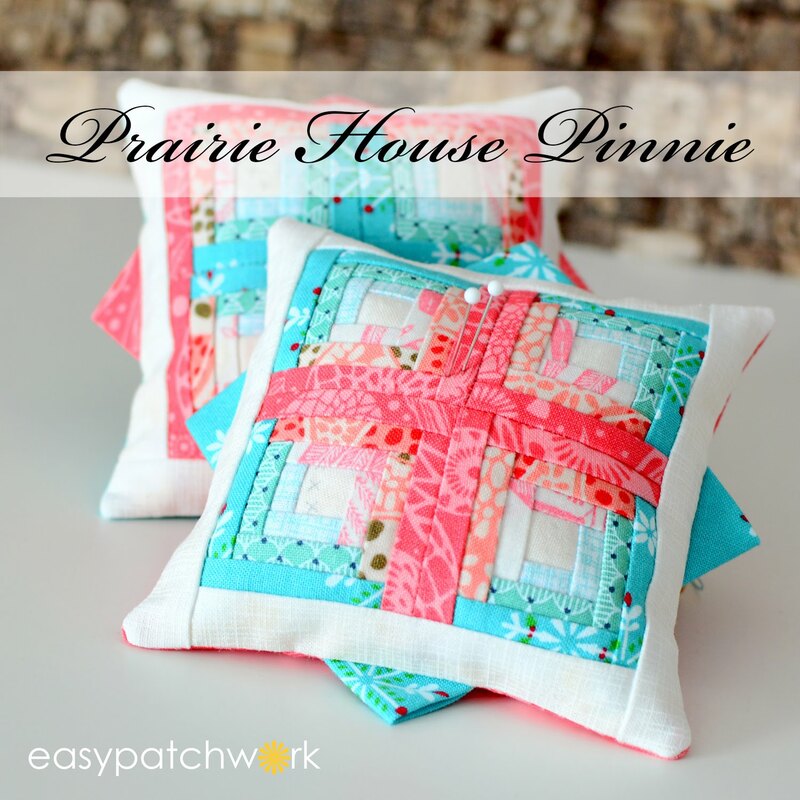 In fact, I created a new pincushion - the Prairie House Pinnie featuring a log cabin design and prairie points. I made this as a special thank you to my #tobeabee German patchwork girls. I wanted to make them something nice. I am terrible at remembering birthdays too. So this is my present to them! I patterned the pincushion as less of a profit for myself and more of a security so others will not copy and profit from my design. I now know, that when I show something on Instagram or here, it will be copied. 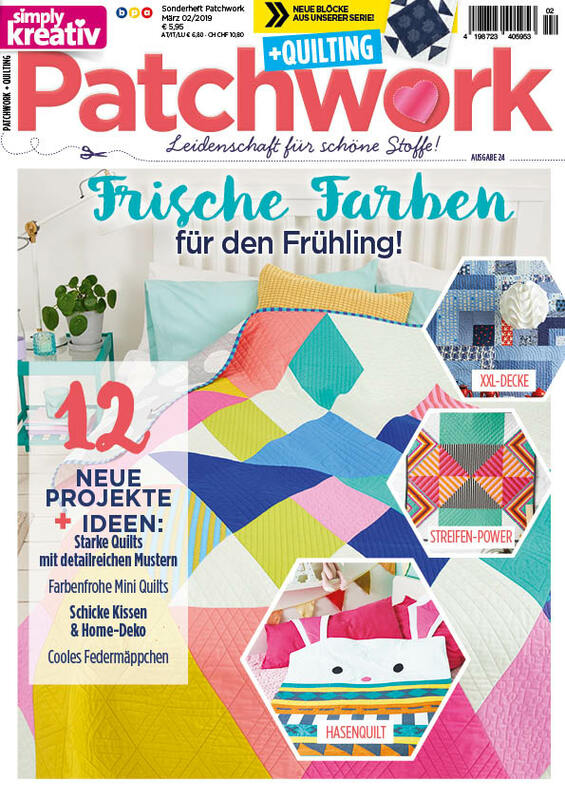 I'd better get the pattern out first, before someone else does. So, it is back to business in a more secretive and sensitive way. I cannot show little glimpses of what I am working on no matter how exciting it is, because the fear of theft is just too great. I would really like to know your opinion on this. Maybe I see this all wrong? Maybe everything posted on the Internet should be free for use by everyone?